Two Grandsons so I need two Classic BSA Trials bikes that look the same for when the boys get old enough to realise they both own a part of British Classic trials History. 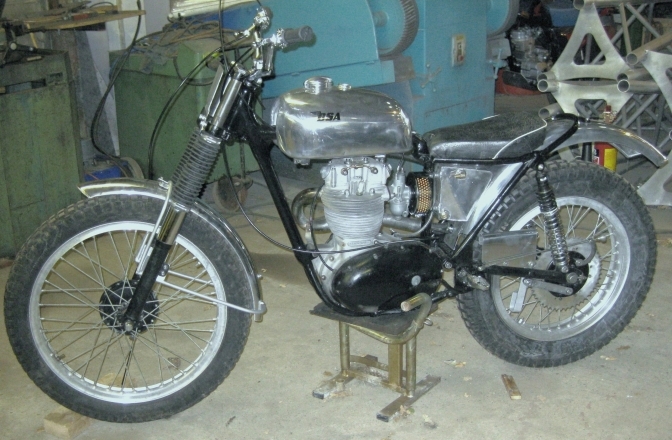 The Replica John Draper "Cotswold" BSA C15-B40 Build. 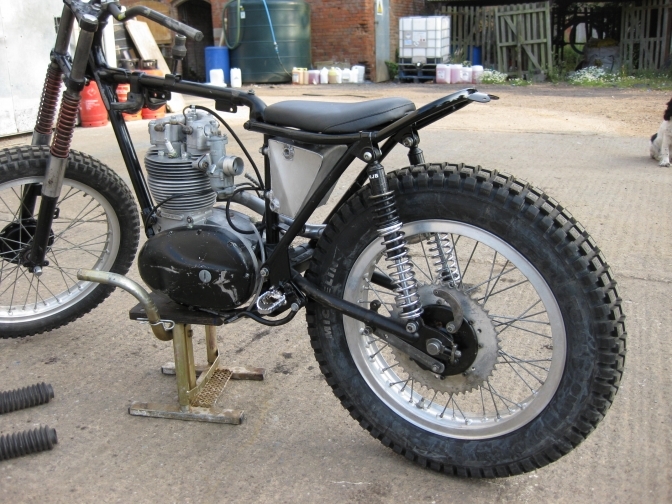 This is a bike that I just need to put together so that both of my Grandsons can own a part of "Classic British" trials bike History. This is what I set out to replicate so that youngest Grandson "Eddie" has a bike like the above that is owned by his brother George. I started the search for parts on the obvious place eBay. Then I came home from visiting the boys and had the feeling that now was the time to start this build. 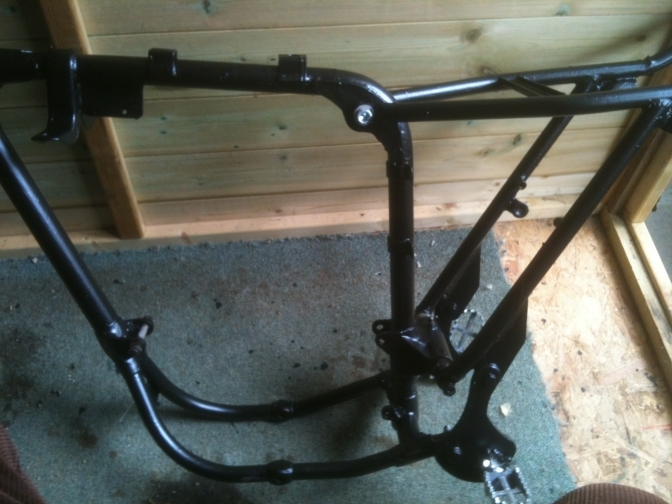 I switched on looking for the C15 frame,it had gone but a new listing at the bottom pointed out the frame had been re-listed along with the subframe and swinging-arm. All in one package for £70. I downloaded the photos again and tried to make them more viewable ,a tip here if you list stuff on eBay if you are going to use a photo, and you need to, use a good one. Anyway I took a chance and hit the button. frame down the rest to go. 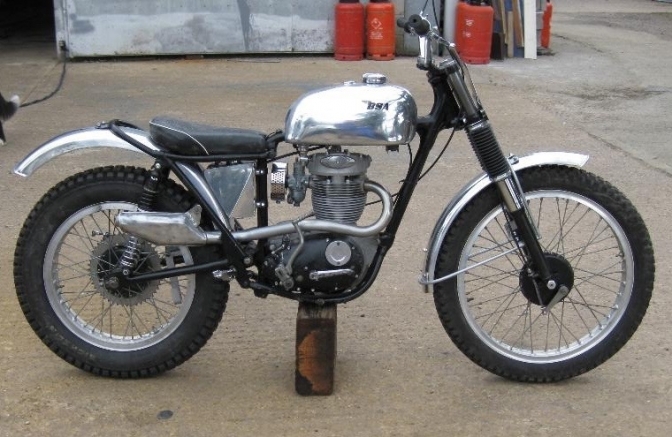 I was also watching a rear hub for a BSA Bantam D10-14, and the photo did make it look good, so I bid on it, I had a widened hub if you remember ,but I was building a replica and the John Draper bike had a standard hub, it was ironic that the one I had widened was the spare hub from John. I don't often see a auction to the end these days I just settle on a price in my head and if it goes over this price I loose out. But this hub looked good and I had the feeling that this was the one. So watched it to the end and bid on it in the last minute and just hoped there was not a "Ferret" as I call them to out bid me in the last seconds. Well I got the hub for £43 and just hoped it would be has good as it looked in the picture. An email appeared on the Tuesday morning to say that I had an immanent parcel arriving at between one and two. Sure enough just after one a van pulled up and a large parcel was carted from the back. I had to have a cup of tea before opening the box Michele. I expected an heap of rust and corrosion but look what I found. Even a dating certificate from BSA owners club. I must say I had a good feeling about this build I only hope it keeps up until the end project, It is for "Eddie". We would wait and see what else appeared before I get to cocky. A knock on the door come Thursday and a large box was thrust into my arms, sign here I have another box for you, I was still trying to figure out in my mind what could be in this box and had forgotten about the hub. 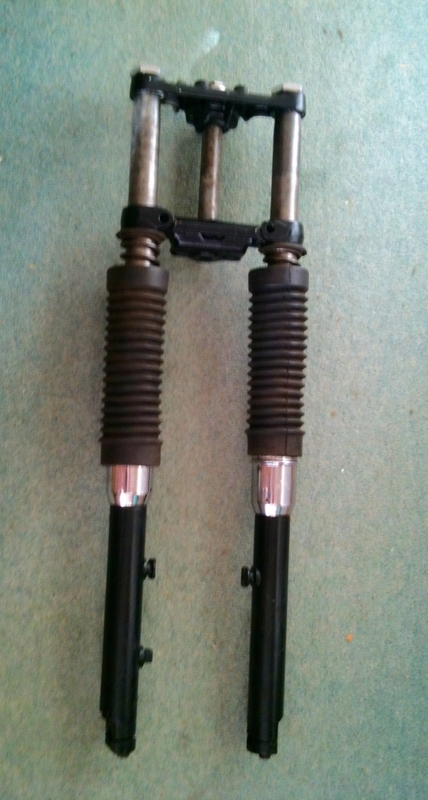 The other parcel was obvious ,it was the forks that I had been watching for over a week on a buy me now situation and not being able to find the BSA top yoke to go with the bottom one I had ,had bought these forks knowing that if I let these go I would regret it later. these were now I know a snip at £180. 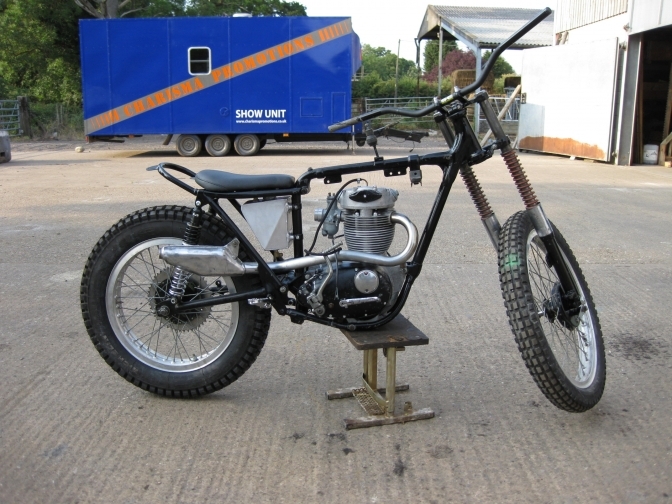 I know they were a bit late for the build being 1969 Starfire but they were only an update to the C15T forks that worked better, and were available. 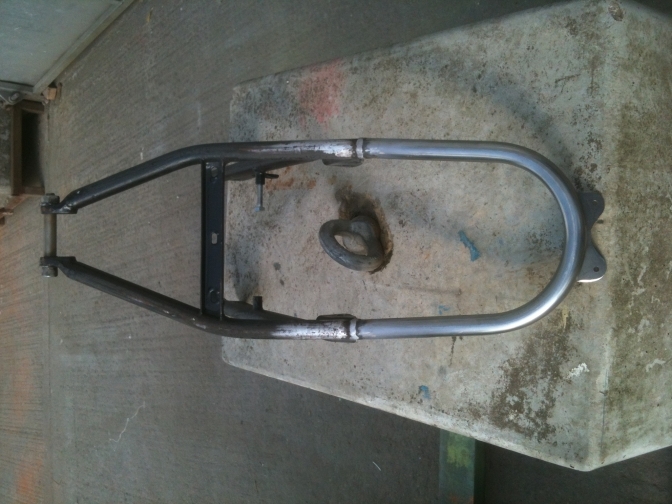 Have you tried finding a good pair of C15T forks and the original yokes no chance. Not a good picture but first class forks. The hub was also better than could be expected and even had nearly new shoes. I did miss out on the front one though from the same vendor, with another last second "ferret'. But I have a plan "B' for the front end. So the parts are coming together,I have some of them from stock, and will need more parts for the engine unit. I need to buy a valanced rear WM2 rear wheel rim next, I have the spoke set and will turn 5/8" to 3/4" wheel nuts to make it fit. 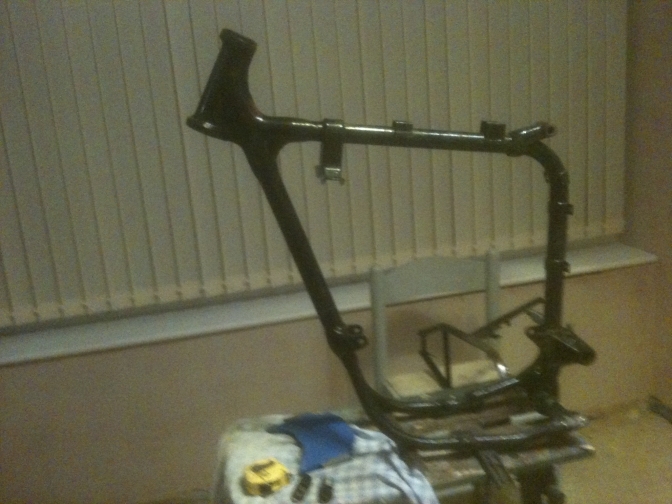 The frame has now had some of the unnecessary castings removed and the subframe as been marked up to be cut. and lowered like the original. I have a list drawn up for the handlebars etc from Trialsbits,but keep adding to it daily,so I will leave it until I have a big box-full to be sent. 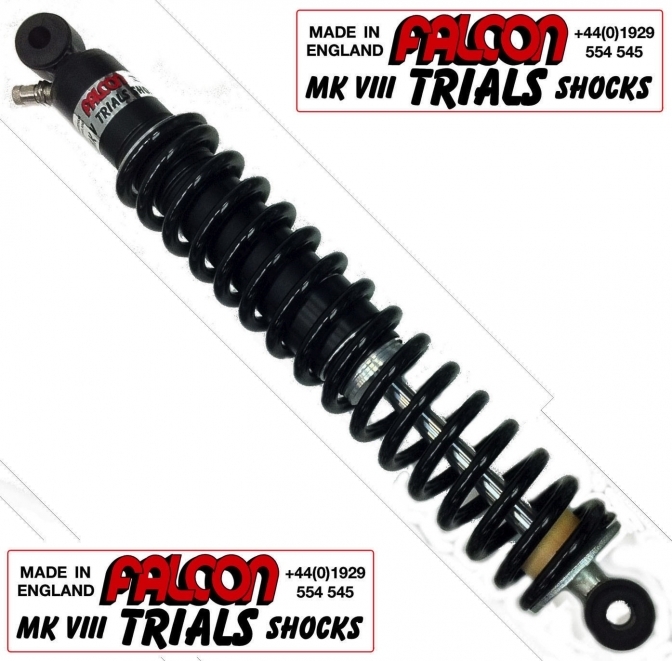 A ferret beat me to a set of period New rear shocks last night so I will now probably fit a pair of steel Falcans. 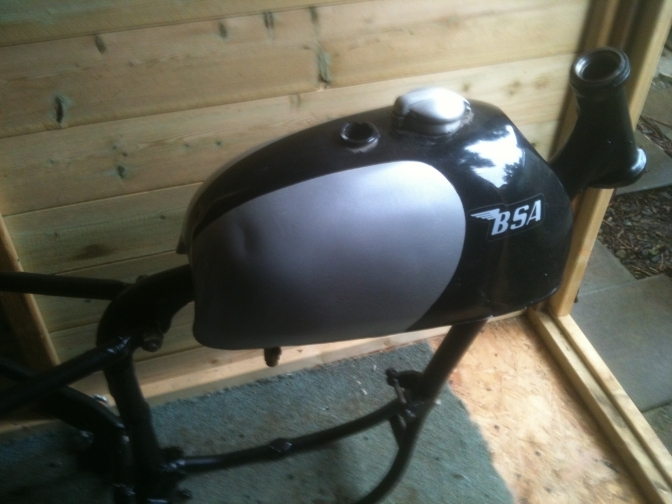 or NJB Experts like BSA "George". Looking through my engine stock I may now fit another 280 cc engine which sits well between the power over the C15T and the bigger bored B40 . I will use the B40 flywheels that I have and find a piston that will match, I will just see how this idea pans out, and it may well change, But is a lot like the approach that the BSA Competition Department used , If you don't try something, you will never know if it works. I will turn these so that they fit inside the bottom frame run tubes to make pick-up points for the new footrest brackets like on BSA "George". 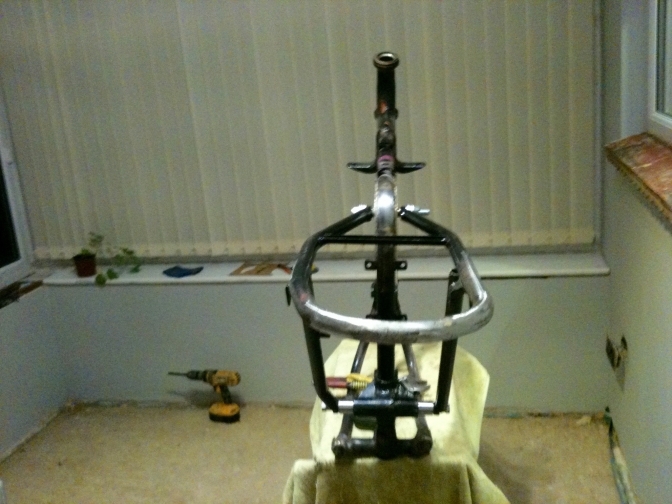 The top subframe mounting is ready to be un-brazed as are the other unwanted castings. I have left the subframe mount so that I can fit two pattern brackets to this with holes 2 1/4" down from the original mounting for location of the New mounting point. 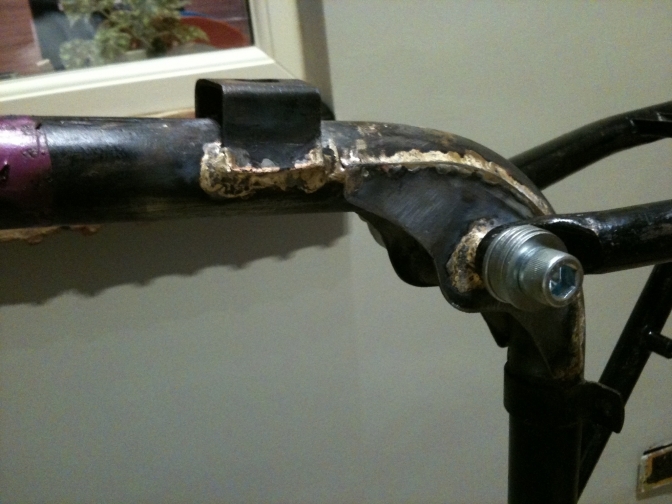 Most C15Ts are modified like the Works used to do, by drilling a hole in the frame tube on the bend and then brazing in a bolt fixing tube. 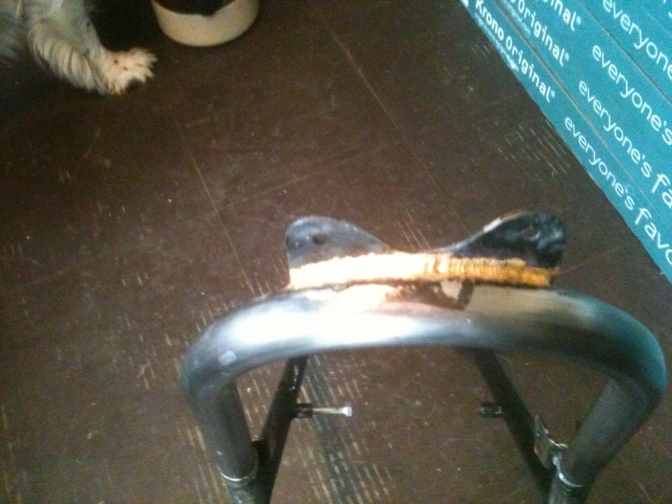 Probably no problem, but not good engineering practice as this is the weak point of the frame then. You can see the most used way of doing the seat lowering exercise on the "Blue" bike. 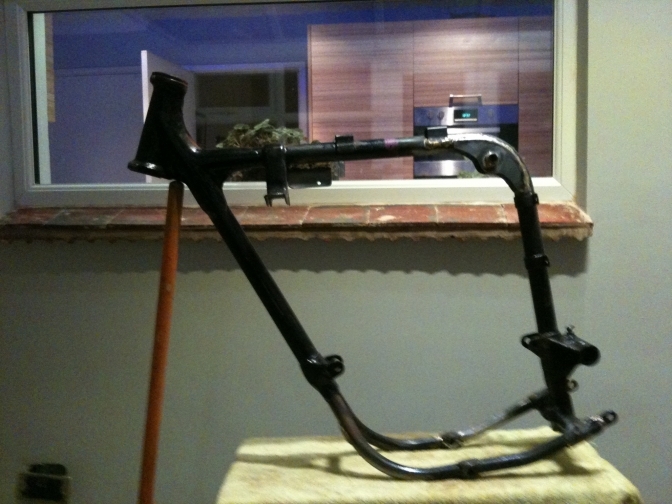 A replica It is to be,and like I would do, the BSA "George" bike has the mounting on the inside of the bend ,a tube sitting between two flinch plates that reinforce this bend in the frame. The bike could have been modified by "Hubbo" himself but whoever did it it seems like the right way. 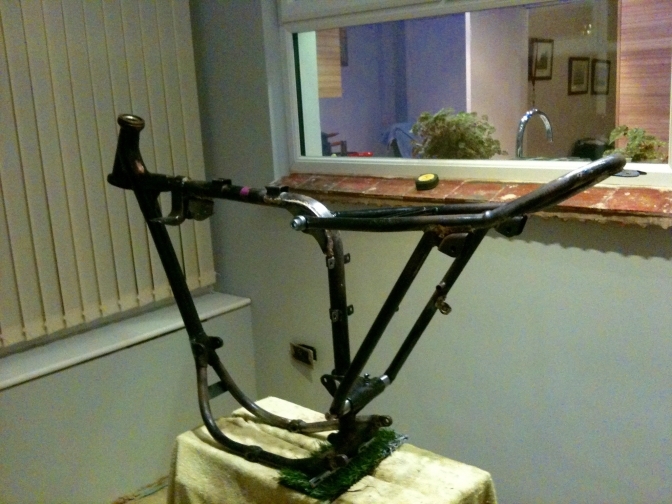 For three afternoons last week and today I have made what I feel for this time of year good progress on the frame conversion. 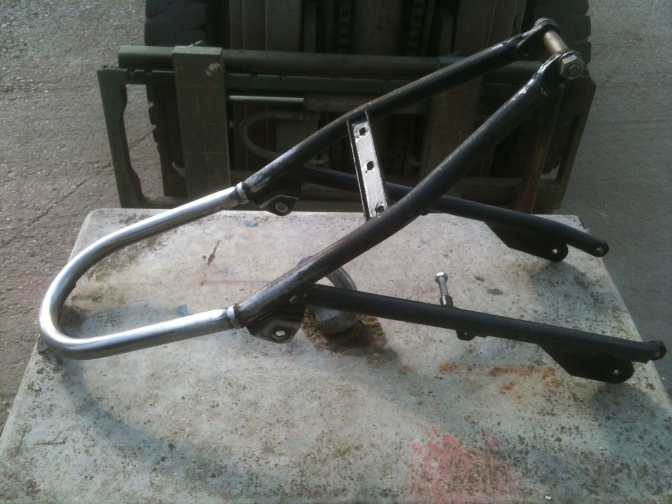 After making a jig to drop the subframe top mounting, just two plates that bolted through the original mounting and dropped the tube to be bronzed on, two inches lower, the tube was then welded. After this ,the original casting and the rest of the unwanted cast lugs were sweated off. 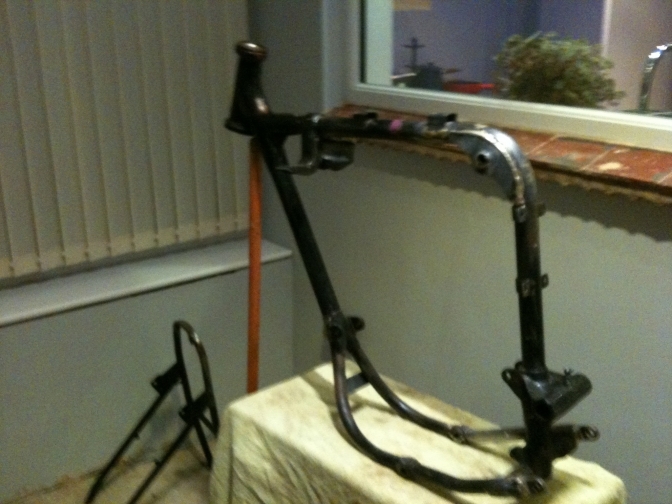 The two machined up original pillion rest mountings were then re braised into the shortened tube ends close to the bottom casting lug. These will now be used for the bottom fixing of the New footrest plates. Today I made up the flinch plates as I call them for re-enforcing the new subframe mounting point and bronze welded them in place, I also welded on a under tank bracket for a coil mounting. 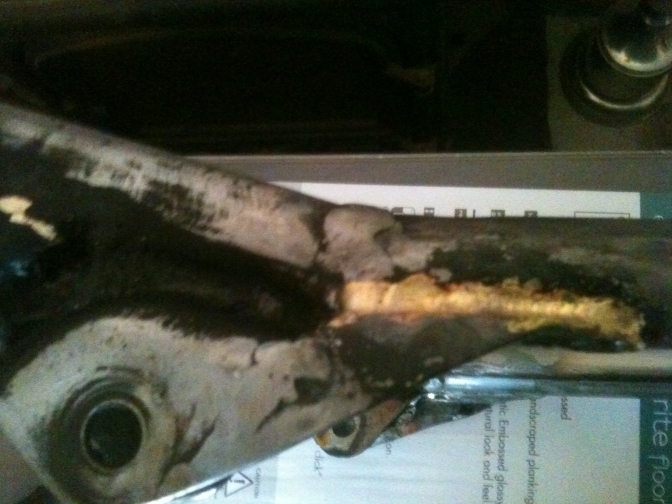 The rear back tank mounting buffer bracket was removed shortened and then re welded back on. 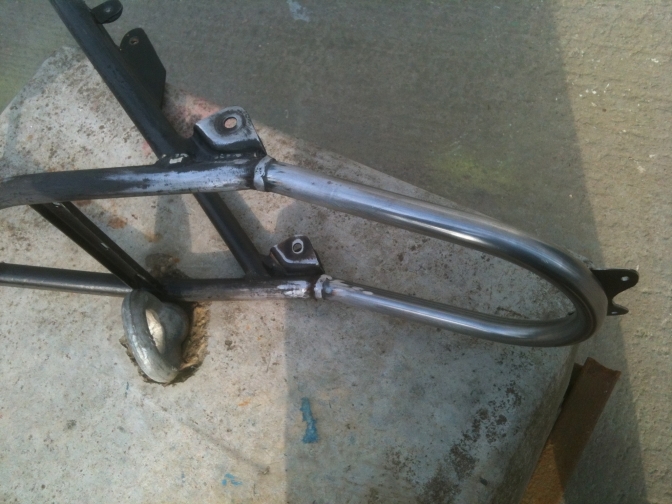 The New swinging arm pin arrived today as well from the same vendor that owned the frame. 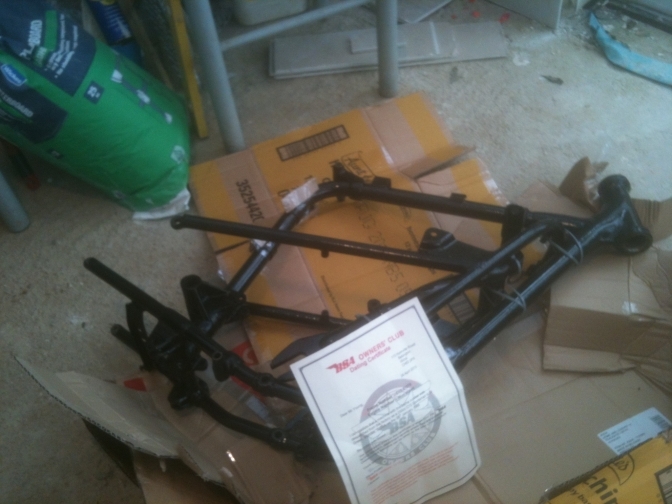 So we can start on the subframe tomorrow. 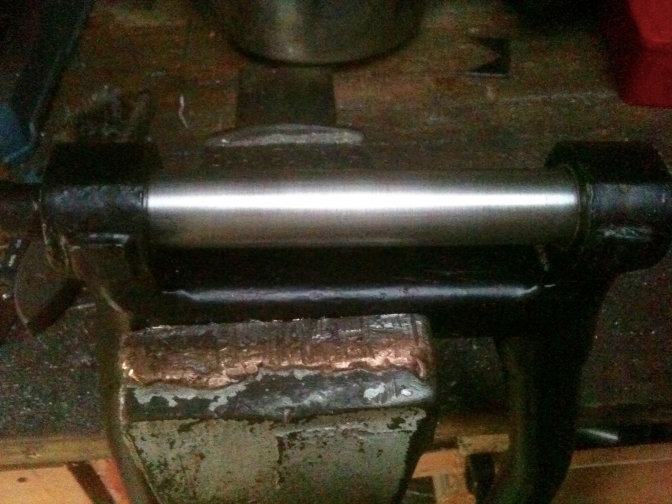 Last week I also made two stepped rear wheel nuts so that the Bantam hub can now fit into the 3/4" C15 swinging arm. Two hours today cutting the subframe down and getting the swinging arm pin to fit nicely, before lining up the tubes to see how they sat. 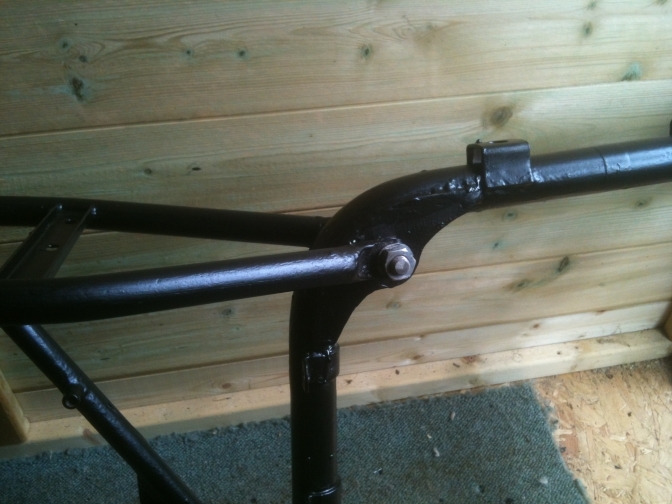 I am pleased, and it bit more dressing in the morning, may see me go to the workshop for the sixty mile round trip to bend the back hoop upwards, and bronze weld the subframe back together. The suspension mountings now sit two inches further forward on the top loop. 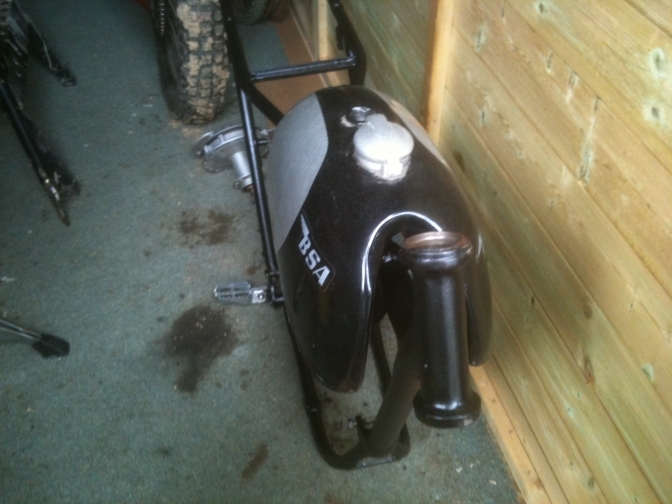 I like the way the new top mounting looks, BSA could have modified there trials frames like this without a lot of problems, If you notice they bronze welded on the tank buffer bracket so they could have quite easily carried on the run of brass around the flinch plate. 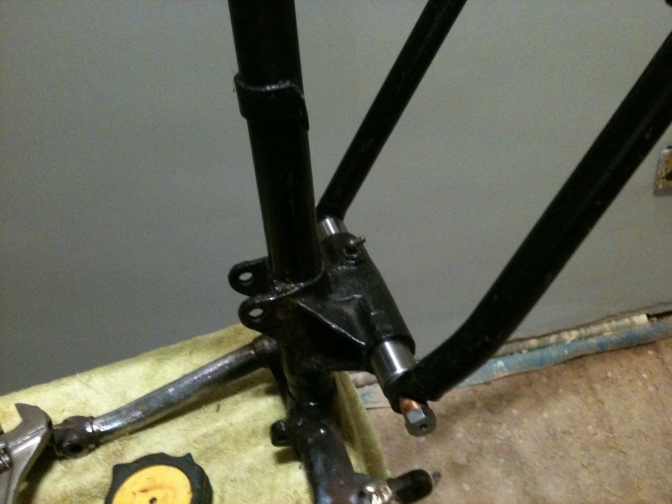 but usually when the swinging arm pin is fitted it never gets touched again, for the miles the road bikes used to do. So to my mind the casting had never been line bored just reamed out from both sides , But that was the good old British motorcycle industry. 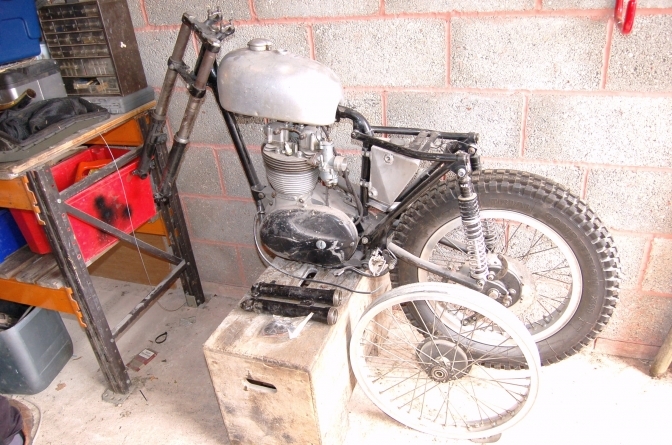 I did notice when I had cut the subframe,that one of the front fixing castings was brazed in not quite on the horizontal, but I can live with that, this is a BSA C15 conversion, when done and said all. 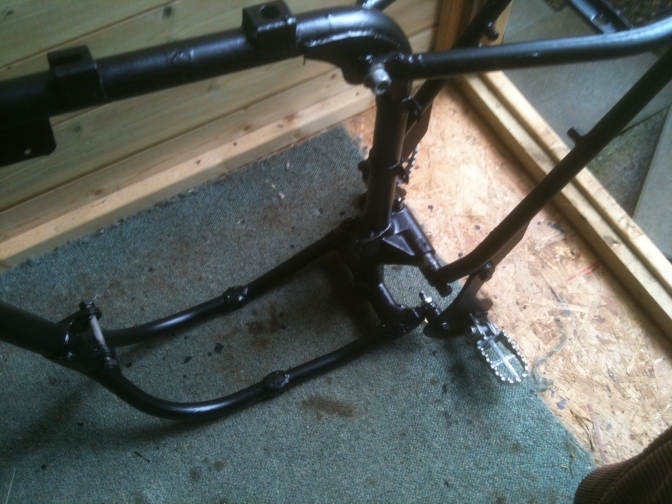 OK today I manged to finish mitering the subframe tubes and the went to the workshop to bend up the loop at the back, make a mudguard fixing bracket and bronze weld up the lowered frame. 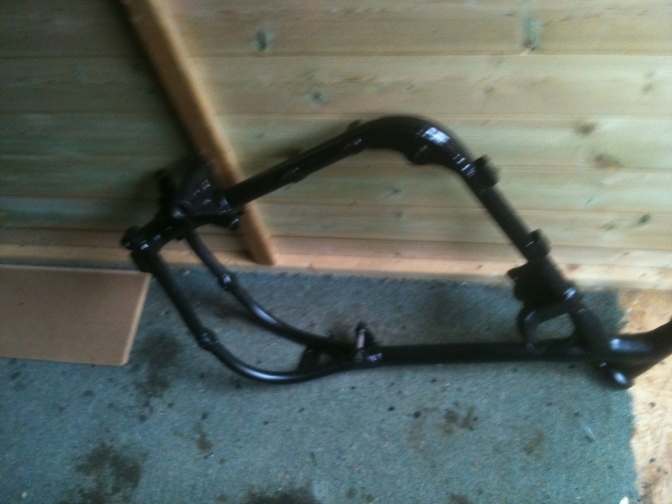 This has taken me two and a half hours again today to get the subframe finished? I have heated and bent up the rear loop to the two inches to match the other altered measurements, if the loop is a bit high for the guard I will reheat it and reduce the hight slightly. 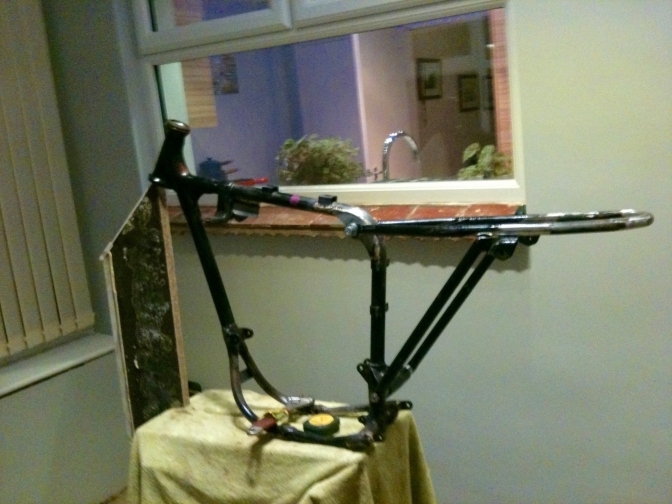 but until the bikes dry build I will not know. I have made the mudguard bracket to the same pattern as the Faber frames as this seems to work best on the alloy and plastic guards. 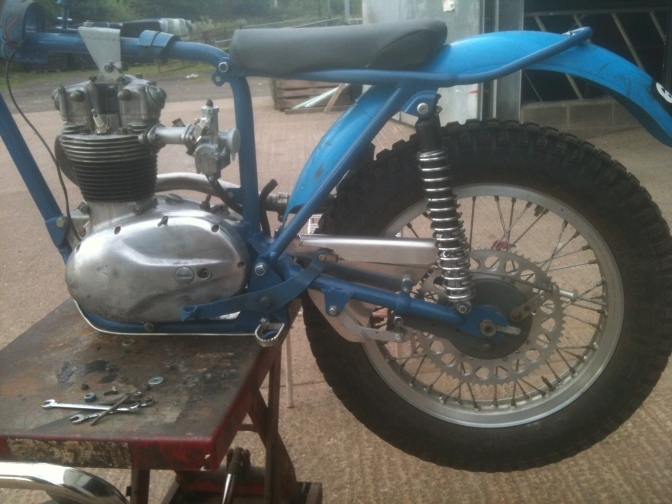 I need to sort the rear wheel rim and the suspension units next, and find a BSA type trials seat. These are photos for me as a guide to what I have to copy from this machine, to the one being built. 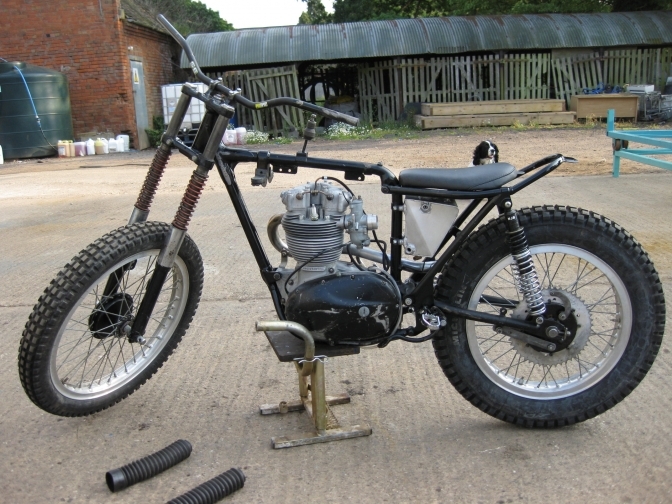 After a Very busy year, I now need to get back to reality for a while , so I thought I would do a bit more work on the John Draper replica bike for grandson Eddie. More later as the build continues. 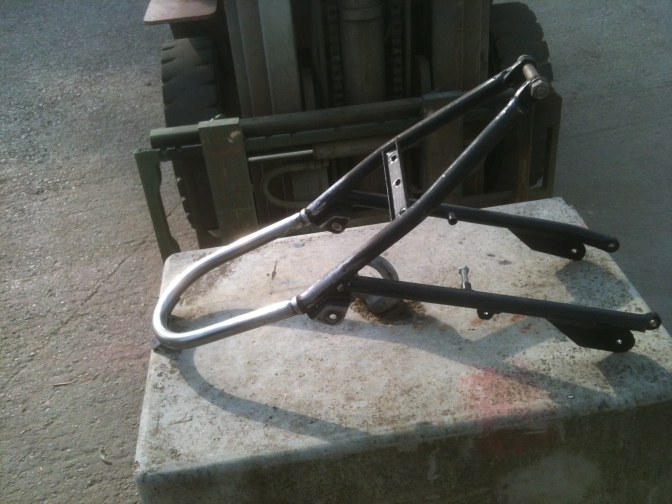 So , I have this week finished the footrest assemblies, on the frame and found out the "Loaf Tank" we are to use. 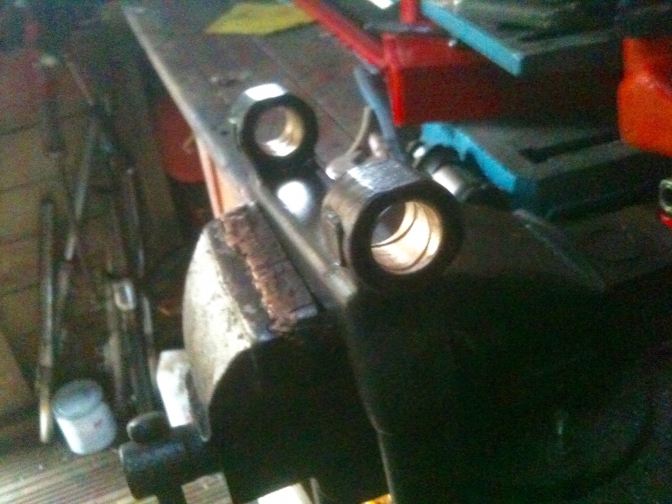 and I have new bearings and yokes to fit. 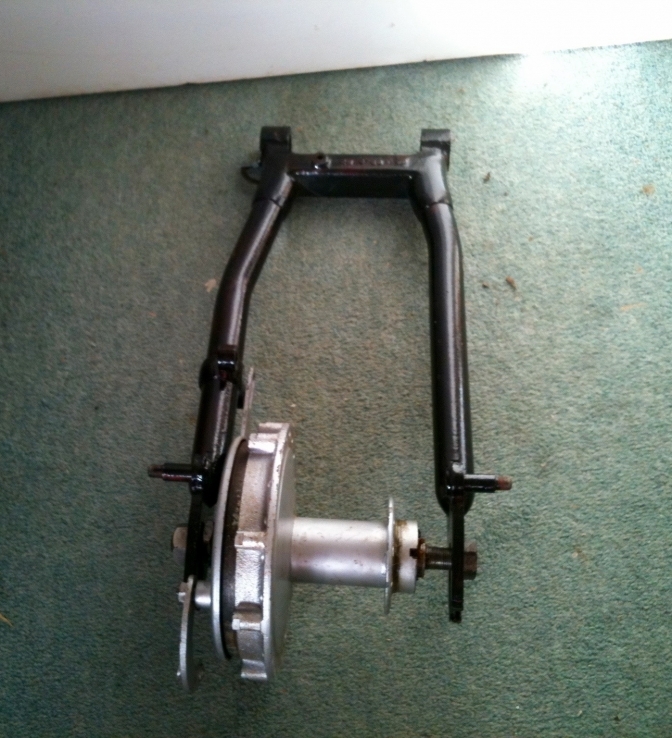 The swinging arm as been modified and new steel rubber in torsion bushes got ready to fit. Tomorrow I will spend the day with the bike so a few more update pictures should be published. Sorry the Foster Otter dripped oil onto the workshop carpet. 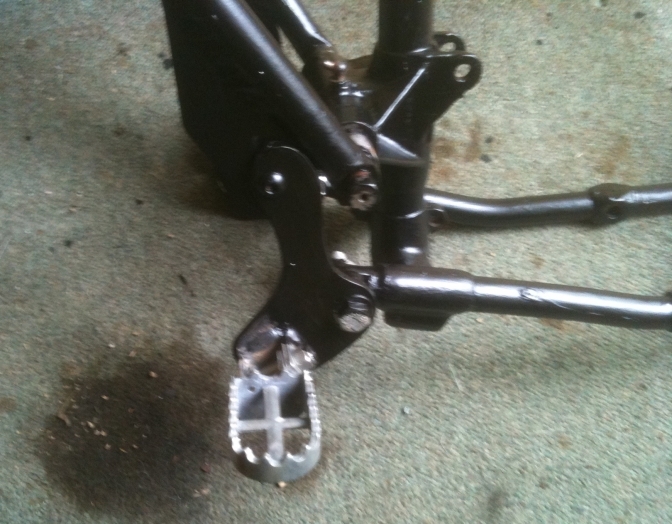 I will be fitting one of my Sammy Miller copy rear brake pedals. I am pleased with the seat tube conversion, and even the distress paint finish, this bike is all about period and what we would have done to the bikes in the sixties. The LYTA tank fits nicely onto the revised tank brackets and lines up with the centre fixing, just need to get three rubber buffers to sit it on. Job done. I yesterday 08/08/2017. removed the subframe and the new swinging-arm pin and pressed the bushes into the swinging arm the problem with these bushes is that they need reaming I used to do this job in the sixties on Triumph motorcycles at North Bar Garage, then we had a ten inch long adjustable reamer to do the job., It seems a lot of money to lay out buying one of these, but needs must and I can machine up the self-centring rod and cone. Perhaps I should Hire it out to you guys? Pictures not that good but it was pouring of rain outside and dark. New bushes fitted ready for reaming. I did not like the subframe so I set too making it more to how I wanted it, and spent two afternoons bending and making a New tail loop, and it now suits me, much better. I stuck with the same size 3/4" tube as it seemed to fit the image better. 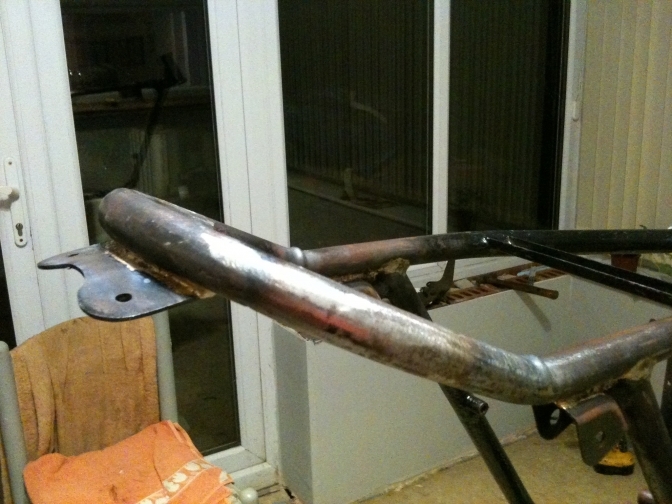 I mig welded the tube to the BSA subframe and the made re-enforcing plates as would have been done at that time. 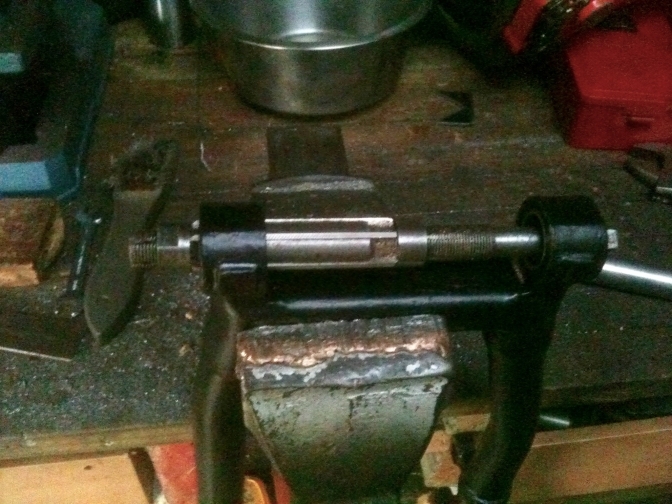 I now have a adjustable reamer the right size, and after about an hour of steady work have the swinging arm pin sliding nicely through the bushes, and also a good fit in the frame. Adjustable reamer did a splendid job, you just need to take your time and adjust it a little at a time. 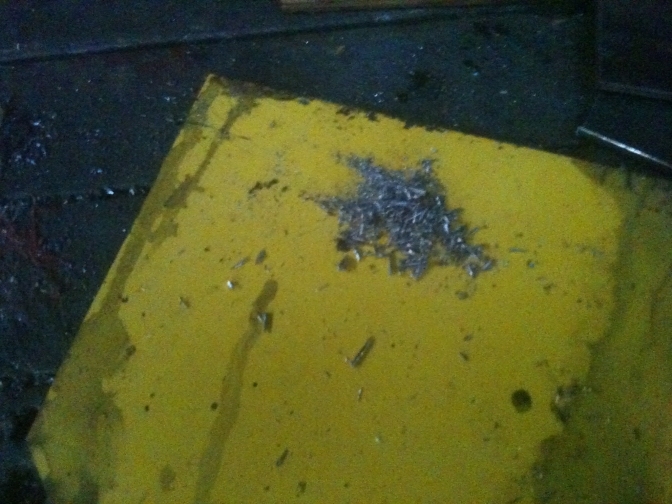 This is the amount of planing's removed by the reamer. The pin now slides sweetly into the bushes.